This is the story of the ancient Andean art, exploring the development of fine and applied art and architecture. Site plans, maps and over 250 illustrations represent the very finest buildings and artworks of these cultures. It is the perfect introduction to the subject for anyone who wishes to find out more about these extraordinary peoples who have helped shape the cultural development of our world. Jones covers the most important cities, fortresses and royal residences of the imperial Huari, Inca Cuzco, Machu Picchu and many other sites. He also covers Inca heritage sites such as Tiwanaku, Chavin, Chan Chan and Nazca. A deluxe book in all color—makes a great gift for those who love Peru! Published at $16.99, our price only $12.95! Imported from Britain. 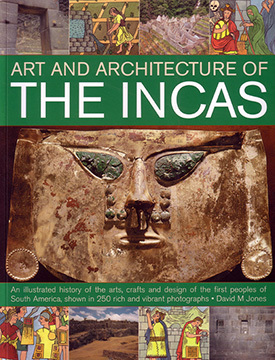 ART AND ARCHITECTURE OF THE INCAS: An Illustrated History By David M. Jones 128 Pages. 8x11 Paperback. All Color. Glossary. Index.